Some mp3's of Billie Holiday. 335kB 1938-May-11 AT 2'51" New York City Billie Holiday and her Orchestra [b] John Kirby [cl] Buster Bailey [d] Cozy Cole [p] Claude Thornhill [tp] Bernard Anderson(?) / Charlie Shavers(?) [ts] Babe Russin NEW: just released! 292kB 1938-May-11 AT 2'29" New York City Billie Holiday and her Orchestra [b] John Kirby [cl] Buster Bailey [d] Cozy Cole [p] Claude Thornhill [tp] Bernard Anderson(?) / Charlie Shavers(?) [ts] Babe Russin NEW: just released! 282kB 1939-Jan-17 BC 2'28" New York City, 2 Sheridan Square, Cafe Society (Broadcast) Frank Newton and his Café Society Orchestra [as] Tab Smith(?) [b] John Williams(?) [d] Eddie Dougherty(?) [g] Ulysses Livingston(?) [p] Ken Kersey(?) [tp] Frankie Newton(?) [ts] Kenneth Hollon(?) / Stanley Payne(?) The first recording from Café Society, NYC. 219kB 1956-Dec-09 BC 1'59" New York City Percy Faith and the Woolworth Orchestra [ann] Donald Wood [dir] Percy Faith Announced by Donald Wood. From GOJ-1018. 436kB 1956-Dec-09 BC 3'44" New York City Percy Faith and the Woolworth Orchestra [ann] Donald Wood [dir] Percy Faith Announced by Donald Wood. From GOJ-1018. 373kB 1959-Mar-04 MT 3'10" New York City, Metropolitan Recording Studio Billie Holiday with Ray Ellis & his Orchestra [as] Gene Quill [b] Milton Hinton [cond] Ray Ellis [d] Osie Johnson [g] Barry Galbraith [p] Hank Jones [tb] Jimmy Cleveland [tp] Harry Edison [v] (12 Strings) Wow! 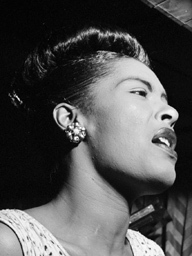 340kB Unknown Date FAK 2'54" Unknown location (none) Unknown Is this really Billie Holiday or a look-a-like? 358kB Unknown Date FAK 3'03" Unknown location (none) Unknown Is this really Billie Holiday or a look-a-like?